Subject: CONGRATULATIONS!! 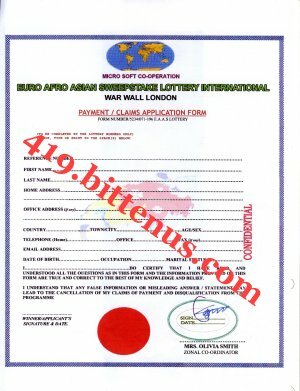 YOU HAVE WON $250,000.00 USD E.A.A.S LOTTERY INC.
We happily announce to you the draw of 2010 Euro-Afro Asia Sweepstakes Lottery International Program held on the 23rd of May 2010 in War Wall London.Your e-mail address attached to ticket number: AG-544 7443465 L44 with serial number: 652-662 and reference number: 7181813-05 which subsequently won you lottery in the 2nd category of batch number: FA1305U-ID.You have therefore been approved to claim a total sum of US$250,000.00 ( (Two hundred and Fifty Thousand United States Dollars) in Cheque. Please note that your lucky winning number falls within our Asian representative's booklet in JAKARTA INDONESIA as indicated in your batch number: FA1305U-ID. In view of this, your US$250,000.00 Cheque would be released to you by Our Asian Fiduciary Agent, Our Asian Fiduciary Agent will immediately commence the process to facilitate the release of your Cheque as soon as you contact Barrister Mohammed Yasin's office in Jakarta Indonesia. Please contact BARRISTER MOHAMMED YASIN in Jakarta Indonesia for your claim with the following details below to enable the speedy evaluation and processing of your winning. 1 Name. 2 Home address. 3 Telephone number. 4 Age and occupation. 5 Ticket number. 6 Serial number. 7 Batch number. 8 Reference number.